All the things I wrote in my review for the book, apply to this film as well. And that says a lot since the book made me have really high hopes for the film. I had all these images in my head already and needed the film to do it justice. And it didn't let me down! Even the hubby watched the movie and loved it! That says a lot, he's quite picky. I laughed and cried in all the same spots as the book, well it was so accurate a film. Really, there was no spots I would have done differently. 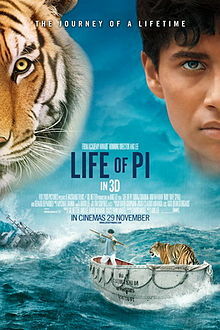 Ang Lee is a fantastic director, and his eye is perfect for what this vivid movie needed to express the story. There really is not much dialogue so he had to be creative in filming, and he was. I can see this stealing the show at all the awards this year. Definitely. My new favorite movie. Ever. DISCLAIMER: I saw the film on my own. I was not compensated. All opinions are my own.